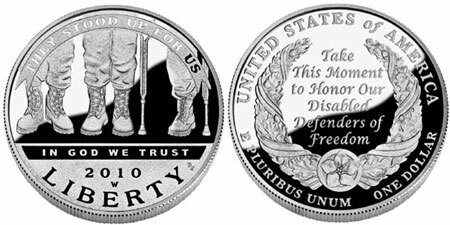 The United States Mint will conclude sales of the American Veterans Disabled for Life Silver Dollar on December 13, 2010. The commemorative coin program was authorized under Public Law 110-277, which provides for the issuance of commemorative silver dollars during the calendar year beginning January 1, 2010. The Mint has typically ended sales of commemorative coins a few weeks prior to the end of the authorization period to allow time for order processing and delivery. The obverse design of the 2010 American Veterans Disabled for Life Silver Dollar features an image of the legs and boots of veterans with a pair of crutches visible within the scene. An inscription above reads “They Stood Up For Us” with “In God We Trust”, “2010” and “Liberty” below. The reverse of the coin features a wreath of oak leaves and branches with a forget-me-not flower at the base. A central inscription reads “Take This Moment to Honor Our Disabled Defenders of Freedom”. Surrounding the wreath are the words “United States of America”, “E Pluribus Unum”, and “One Dollar”. The commemorative coins originally went on sale February 25, 2010. The discounted introductory pricing was $33.95 for uncirculated coins and $39.95 for proof coins. After March 29, 2010 regular pricing of $35.95 and $43.95 went into effect. Coins are struck in 90% silver and 10% copper, with a weight of 26.73 grams and diameter of 1.5 inches. Through November 7, the US Mint has recorded sales of 177,606 proof coins and 72,248 uncirculated coins. The maximum authorized mintage across both versions is set at 350,000. All sales include a surcharge of $10 per coin. This amount is distributable to the Disabled Veterans’ LIFE Memorial Foundation for the purpose of establishing an endowment to support the construction of the American Veterans’ Disabled for Life Memorial in Washington, D.C. Coins may be ordered from the United States Mint online at http://catalog.usmint.gov through the conclusion of sales December 13, 2010.